A re-design of the propulsion system on LOS 118 has resulted in a total weight reduction of 5 tons. The new displacement requires less engine power to perform the contractual speed of 25 knots, which is provided by two VOLVO PENTA D16 engines rated 480 kW (rating 1). This does not only reduce the fuel consumption with 30% but provides a long life power train with 20.000 hours MTBO. 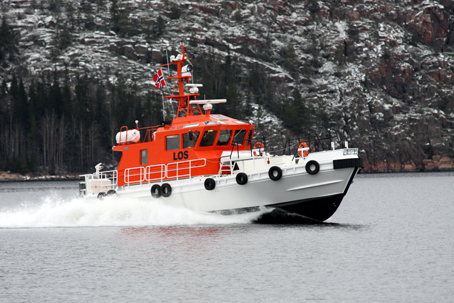 When DOCKSTAVARVET delivered LOS 116, Yard No 551, to the Norwegian Coastal Administration in May 2008 the boat was received with acclaim at the Fedje Pilot Station outside Bergen. The boat full filled all their requirements regarding seakeeping, operational characteristics and comfort with a noise level inside reaching only 61 db (A) at full speed. However, with a full load displacement of 38 tons and oil prices peaking in mid 2008 fuel cost became worrying. LOS 116 is fitted with a quite heavy propulsion system of 2 x 720 kW with CP propellers giving a service speed of 27 knots.